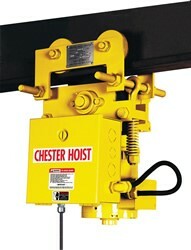 Chesterhoists.com is an authorized source for all Chester Products and Equipment. 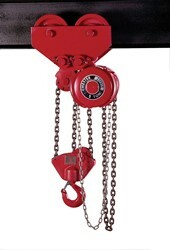 Chester Hoist has been an affiliated master distributor for Chester products since 1927. Now sourcing for Chester Hoists and Chester Hoists parts over the web has never been easier. Experience, knowledge, and trust are the cornerstone qualities of Chester Hoists. In addition to our broad array of crane services, we carry the following categories of products related to overhead bridge cranes and hoists in stock. Please call on us to assist you in specifications and procurement of these products. 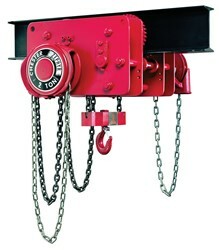 Air hoists, barge winches, breaks, bumpers, chain, chain hoists, collector shoes and assemblies, come-alongs, conductor bar, crane blocks, crane hooks, c-track, electric hoists, electro-magnets, festoon systems, fittings for rigging, free standing cranes, gantry cranes, gear boxes, grabs for mechanical lifting of coils, drums, paper rolls, etc., hooks, horns and sirens, hydraulic-operated tongs, hooks, lifters, jib cranes, lever hoists, load chain, magnetic lifting devices, manual hoists, mechanical grabs, grab hooks, monorail systems, motors, pendant controls, pneumatic hoists, pneumatic winches, pushbutton controls, radio control systems, ratchet hoists, safety latches, shackles, slings (chain, synthetic, wire rope), soft start controls, stage hoists, suction cup lifting devices, spreader bars, vacuum lifting devices, variable frequency drives, warning lights, winches, wire rope replacements, and wire rope hoists. We provide these products and an array of related services to our customers when they need it, 24 hours a day, 7 days a week, 52 weeks a year. We specialize in overhauling your equipment during periods of downtime, such as shutdowns, weekends and holidays.